This popular Indian snack tastes amazing but can traditionally be quite greasy and unhealthy. 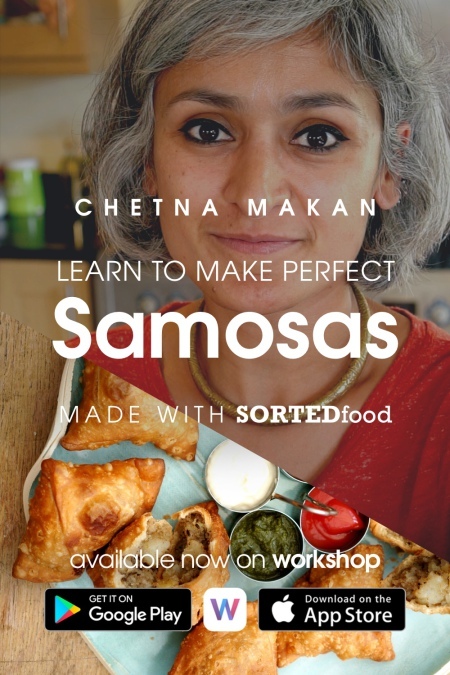 So SORTED have created a recipe for a baked Samosa instead of fried, with a delicately spiced lamb and pea filling. Tasty both hot or cold these make a great starter or are spot on for a sharing platter. Mix flour, onion seeds, turmeric and salt in a bowl. Add the melted butter and warm water slowly until it forms a ball. If too dry add more warm water. Knead for 5-8 minutes until the pastry is smooth and has come together, then cling film. Put in fridge for about an hour. Fry the lamb in a dry hot pan with spices for one minute. Dice onion and chilli and grate both the garlic and ginger into the pan, frying for another two of minutes. Squeeze in the tomato puree and fry for 5 minutes until onions and meat are cooked. Put the peas, seasoning, chopped mint and coriander into the mix with a squeeze of lemon. Place pastry onto a floured surface, roll into a sausage shape and cut into 6 equal pieces. Roll each piece into a ball and roll into a circle- the pastry should be rolled out as thin as possible. Cut the circle into half, brush the edges of the semi circle with water and fill one side of the semi circle with a ball of the mixture. Fold over the pastry so that it forms a triangle shape and press edges to seal. Dab the samosas with water and put on a non-stick baking tray.